Drivers speeding have a higher chance of a rear-ender, and therefore a higher chance of back injury. Whether you commute daily or go on long journeys frequently, by the end of the week, most of us who drive will have spent a significant amount of time behind the wheel. That’s why it’s so important to make sure that your seat is set to the correct ergonomic set up so that you’re more comfortable and you drive better. After you’ve adjusted your seat correctly, wear the Posture Medic on longer journeys to support your back and improve your posture as you drive. Your car seat must be comfortable, and should not feel painful when you drive. If it does, you need to adjust it to a position that best suits your body and your own requirements. Your car manual will have more information and guidelines that you can follow if you are unsure. It’s important to have the right amount of legroom so make sure that you slide the seat into a position where you can operate the pedals easily with your feet. You must be able to lift your feet completely off of the pedals, and your legs must not be squashed up underneath the wheel whilst your thighs must be relaxed yet supported. You should not lock your knees as you drive as this can affect circulation which can not only make you feel dizzy, but could cause you to potentially faint. Instead, keep your knees slightly bent and be sure that you can easily move your legs and pelvis during travel. Keeping a cramped position for an extended period of time will not only lead to pressure on the joints and prevent blood flow, it can lead to Deep Vein Thrombosis which is very serious and can sometimes be fatal. We often don’t have our seat correctly tilted and our necks are either held too far forward or too far backwards as we drive. 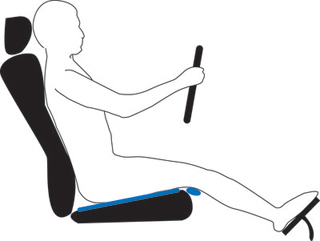 Your driving seat must be tilted enough to support your bottom and thighs evenly, making sure the thighs pass the seat ideally so that the backs of the knees do not make contact with the seat. Your legs and pelvis should be able to move and change position freely without you having to take your attention away from the road. This will help to relieve pressure points and boost blood circulation. Setting the correct angle for your driver’s seat is something we don’t often pay a lot of attention to and once adjusted, we tend to forget about it after we’ve done it the first time. It’s important not to be angled so that you are too upright in the chair or too far back. The seat must be reclined between 100-110 degrees – as shown in the reference picture. Your shoulders should be behind your hips not in line with them, this gives you support on your upper body and keeps you upright and able to be aware of what’s around you. Try not to lean forward in your seat or hunch over the wheel. 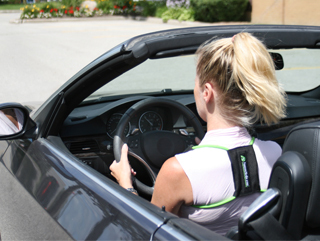 Wearing the Posture Medic while driving will help you to keep the upper body perfectly aligned. Having a seat that’s too low or too high can affect driving ergonomics and your comfort. You should raise the seat enough to have a good view out of the windshield but not so high that the legs catch on the steering wheel. There needs to be an appropriate level of leg room so that you can drive comfortably and safely. A Lumbar support is an excellent addition to a long drive, particularly if you suffer from a bad back. Many cars today have a lumbar support built-in but they can be purchased in their own right to be added to your seat. Adjust the lumbar support so that the curve of your spine is supported evenly and that you are not over-extending your back as these can lead to injuries. It should support your back gently. Some vehicles have the facility to allow you to tilt the steering wheel and pull it closer to your body using a telescoping steering column. Adjust the reach of your steering wheel so that your shoulders and back are relaxed and your wrists remain straight. You can do this by altering the tilt. The correct way to hold the wheel to prevent your arms from tiring and allow you greater control over the wheel is to hold the wheel at 3 and 9 o’clock positions. Never drive with your wallet in your back pocket. It can twist your pelvis and puts strain on your back. Always remove your wallet before driving. As you get into the car, sit on the seat first and then swing your legs into the car. When getting out of the car, slide the legs out first, then stand up. This helps to eliminate lower back strain. Hold the steering wheel firmly, but never clench the wheel. Take regular breaks from driving every 2 hours, making sure to stretch not just your back and shoulders but your hands and wrists as well. Holding a steering wheel for long periods without a break can cause carpal tunnel syndrome. If you are sharing your car with other people, remember to check the position of the mirrors and adjust accordingly every time. We hope you find these tips interesting and helpful. Let us know what you think! How did this help to improve your driving? Don’t forget to wear your Posture Medic to help you keep your posture stabilised during long drives!